Its low costs, versatility and disposable nature are some of the reasons that this drone has made headlines in recent tech-watching news. The stories are talking about these disposable drones made of plywood, relatively cheap to make and able to travel at a low altitude with no need for airfield-type landing zones. They are also being referred to as a "logistic resupply system." The company listed advantages in their design. Among them: The gliders would be able to operate in all weather conditions including high winds; the gliders would be able to deliver supplies anywhere a parachute airdrop can. The US military has been flight-testing the gliders. The company behind them is Dixon, California-based Logistic Gliders Inc (LGI). The drones were developed under contract with DARPA and Marine Corps Warfighting Laboratory (MCWL). Tyler Lee in Ubergizmo reported on the cost of making these, which is low. The plywood drones were relatively cheap to put together, "estimated to cost a few hundred dollars each." Evan Ackerman in IEEE Spectrum expanded on the plywood and parts. "As LGI says, each glider is 'essentially a wooden box.' There are some electronics and a few servos that make up the autopilot and gas springs that help the wings deploy, but that's it. The majority of the vehicle is weather-resistant plywood, and the entire thing only uses about 400 individual parts, which includes all the screws." How are these unmanned cargo gliders deployed? One option is being deployed from the rear of cargo aircraft or dropped from a helicopter. Then, after release, the wings unfold. Reports pointed to a 23-foot wingspan and payload capacity of up to 700 pounds. They can fly autonomously; the disposable glider can be flown by a remote pilot using RC (Radio Control) and FPV (first person video) too. How do they land? A glider can do so horizontally, on its belly, but also can land vertically, using a parachute. Ackerman said, "Landing is a sort of controlled crash no matter what." The single-use glider has completed 12 prototype flight tests, said the site, with a total glide time of 54 minutes, 21 seconds. Some were flown autonomously and others using RC. Seven gliders were flown via RC (radio control); 5 were flown autonomously. Engadget said the tests will continue. 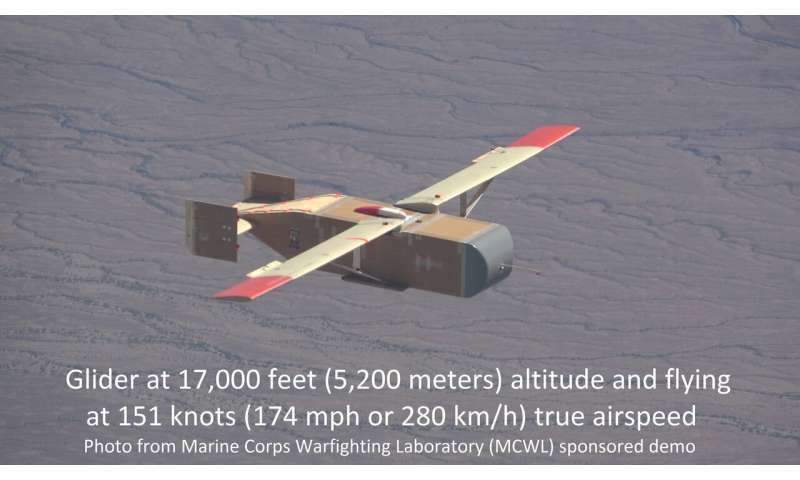 "Logistics Gliders, said the report, "plans to continue testing its disposable gliders this year under its contract with the Marines." LGI on its own site said they are working on two designs for a low-cost, disposable, single-use glider. Their LK-1K glider is 10.4 feet (3.2 meters) long with a 23.2 foot (7.1 meter) wingspan and a cargo capacity of 700 pounds (320 kilograms). The LG-2K RAIN glider is 12.7 feet (3.9 meters) long with a 27.2 foot (8.3 meter) wingspan and a cargo capacity of 1,600 pounds (725 kilograms). "Getting supplies delivered to troops in remote areas is one of the logistics problems military forces confront," commented iHLS. "In many cases, it's too dangerous to send an airplane or helicopter, so the military is always looking for new ways of carrying out such resupply missions." Wait for this to be featured as a delivery vehicle for Bond in an upcoming movie. Yeah interesting... other throwbacks such as musks 50s starship design, dirigibles, prop-driven planes, makes you wonder what was suppressed to promote jet and rocket tech with military applications? Or just complexity-driven profit motive? Musk is building his willy ley spaceship out in the open, in a field. This is as subversive as electing a real estate developer president. Some were flown autonomously and others using RC. Seven gliders were flown via RC (radio control); 5 were flown autonomously.